Throughout its history, The Coca-Cola Company has captured the spirit of the times through its advertising art. From its first promotional calendars produced in the 1890s, the Company linked itself to the popular designs and lifestyles of the era the art represents. The Coca-Cola Company used the work of the top artists of the day, including the leading artists of America's Golden Age of Illustration. Their work for the Company exemplifies the classic All-American image they helped create in the first half of the 20th Century. The famous illustrators produced paintings for The Coca-Cola Company from the turn of the century into the 1960s, when their art form was replaced by photography in the Company's advertising. Much of the work of artists working on behalf of The Coca-Cola Company is beautifully displayed in a recent book, Coca-Cola Girls: An Advertising Art History by Chris H. Beyer (Collectors Press, Inc.). The richly illustrated history captures the Company's compelling use of "radiant, vivacious, and breezy" young women, always dressed in the latest fashions, in Coca-Cola advertising since the late 1800s. The vast majority of the Company's advertising posters and calendars featured these beautiful women, who became synonymous with the most recognised trademark in the world. In his book, the first art book The Coca-Cola Company has licensed for publication, Beyer writes,"one of the most consistent focuses of the Company's advertising has been its depictions of attractive young women who persuade their audience to enjoy a glass of 'Delicious' and 'Refreshing' Coca-Cola." The earliest use of an artist's signature by The Coca-Cola Company was on the work of Hamilton King, a prominent artist at the turn of the century. King illustrated the beautiful "Coca-Cola girls" for calendars from 1910 to 1913. His work also appears on serving trays. Over the next quarter century, the Company used a wide variety of illustrators, some of whom signed their works. But most did not. The anonymous craftsmen produced lavish illustrations with deep colors that graced calendars and other promotional pieces. In the mid 1920s, The Coca-Cola Company began working with a young illustrator who would become synonymous with both Coca-Cola and Santa Claus. His name was Haddon H. Sundblom. Trained at the Art Institute of Chicago and the American Academy of Art, Sundblom developed a bright style that depicted wholesome, healthy, happy people. These upbeat and cheerful images would become familiar and comforting icons during the dark days of the Great Depression. Sundblom not only worked for The Coca-Cola Company, but also created the "Quaker Man" character for the Quaker Oats Company and did work for Packard, Nabisco and Colgate-Palmolive. Sundblom created his first Santa Claus for The Coca-Cola Company in 1931, using a retired salesman named Lew Prentiss as his model and later using himself. His Santa was plump and friendly with twinkling eyes. Sundblom continued drawing Santa for holiday campaigns for more than 30 years. By then, the Sundblom Santa had become an enduring American institution and permanently fixed St. Nick's image as rotund and jolly, dressed in red and white. Born in New York City, Norman Rockwell decided early to become an artist and trained at the New York School of Art, the National Academy of Design and the Art Students League. Between 1928 and 1935, Rockwell painted six different illustrations that were used in Coca-Cola calendars, serving trays, posters and in one Saturday Evening Post ad. His best-known illustration for Coca-Cola was, perhaps, "Out Fishin" 1935 - depicting a young boy, resembling Tom Sawyer, sitting on a tree stump fishing, accompanied by his dog and a bottle of Coca-Cola. One of America's foremost illustrators and the father of artist Andrew Wyeth, Newell Conyers Wyeth was commissioned to execute illustrations for The Coca-Cola Company, including magazine ads, calendars and posters. The posters include a series of illustrations on the lumber and transportation industries for the "Our America" educational series.Wyeth was hired to produce the Company's 50th Anniversary calendar in 1936. His illustration was a classic, set against a New England coastline with a bearded old sailor leaning on his boat while a little girl stands nearby, both with bottles of Coca-Cola. A student of Haddon Sundblom, Elvgren is perhaps best known for drawing and painting pin-up girls. His style was so similar to Sundblom's that he could finish paintings that his mentor had started. "Elvgren is probably second only to Sundblom himself in having his artistic images identified with Coca-Cola," Elvgren's son Drake told The Coca-Cola Collectors News in 1999. Drake Elvgren and co-author Max Allen Collins published a 200-page book about Gil Elvgren titled Elvgren: His Life & Art (Collectors Press, Inc.), which includes many of his ads for Coca-Cola and documentary photos of modeling sessions for those ads. Born in Chicago, Mizen is known not only for his commercial illustrations but also for his paintings of Native Americans. He illustrated the first Coca-Cola billboard in 1925 and produced work for numerous magazines, including Colliers and the Saturday Evening Post. He also produced paintings that The Coca-Cola Company used in newspaper and magazine ads. One of his best-known works for The Coca-Cola Company was an illustration of bears drinking Coke in Yellowstone National Park. Born in Vermont, Stanley never took formal art training. After serving as a soldier in World War I, he sold four paintings in New York City and spent the rest of his career as a successful commercial artist. The Coca-Cola Company was one of 28 companies that employed his skill as an illustrator. For years, folk artists used Coca-Cola as a subject for their artwork because of its popularity. 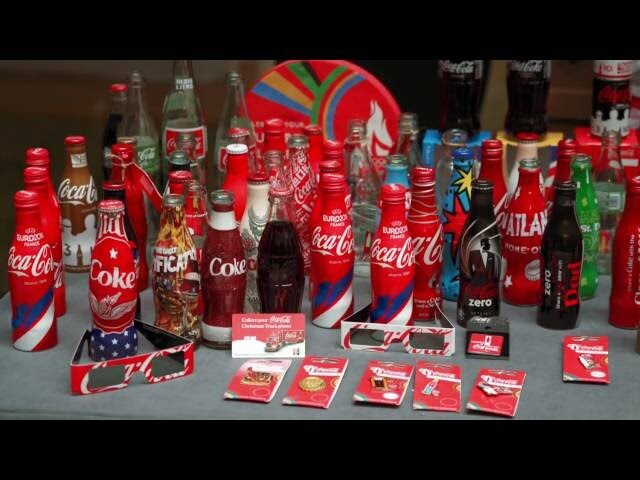 During the 1996 Olympic Games in Atlanta, the Company orchestrated the Coca-Cola Olympic Salute to Folk Art exhibit, which included the work of folk artists from 54 countries who used indigenous materials to create Coca-Cola contour bottles. These three dimensional sculptures ranged from two- to 12-feet tall.